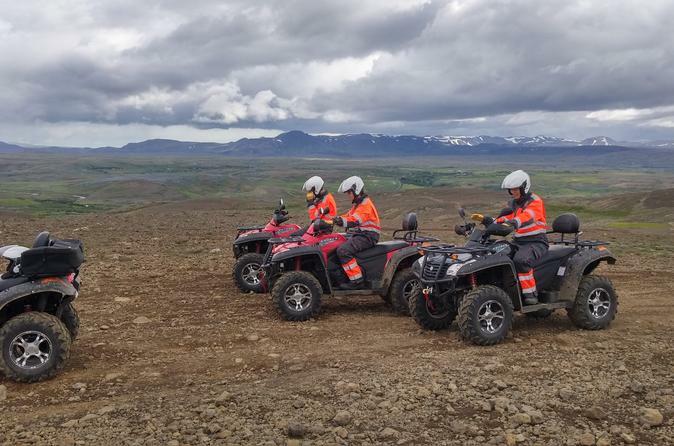 Escape the city and head to the hills for a thrilling 4-hour ATV adventure from Reykjavik. Tackle the hair-raising terrain of the Hafrafell and Úlfarsfell mountains and venture off road as you zip along dirt tracks, splash through muddy rivers and get your adrenaline pumping on steep mountain passes. Stop along the way to see the Hafravatn Lake and Tröllafoss waterfall, and admire dramatic views over Reykjavik bay, the Hengill geothermal area and the whole Reykjanes peninsula. Ideal tour for those looking to get off the beaten track in Iceland! Begin your Extreme Gear ATV Quad tour from Reykajvik with pick-up from your centrally located hotel, then leave the city behind as you journey into the mountains. After learning to drive your all-terrain vehicle, fasten your helmet and hop aboard for an exhilarating and fast-paced adventure. Follow your guide on a thrilling off-road circuit and get your adrenaline pumping as you tackle challenging terrain, zoom along dirt trails and splash across rocky river crossings. Climb high into the Hafrafell and Úlfarsfell mountains and pause to take in the spectacular views across the Reykjanes peninsula. Gaze out across the coast as your guide points out Reykjavik, Faxaflói bay, the Esja mountain and if you’re lucky, the distant Snæfellsjökull glacier, which can be seen on clear days. As you head back to your starting point, pass the peaceful waterfall of Tröllafoss and enjoy time at an authentic Icelandic farm before heading back to your Reykjavik hotel.